Wedding is an exciting and festive day, not only for newlyweds, but also for the guests. So you want to make a couple nice and give an original and memorable gift! Wedding card is an indispensable part of greeting. The way you sign a birthday card, depends on its type and the degree of closeness of your relationship with the groom or the bride. If you are quite distant and your relationship is not so close, you can purchase a standard card with lyrics. There is no need to write in huge text because all the wishes and kind words already given in the printed poem. In its upper part, before the text, write the treatment and will - congratulations on the wedding day. Remember to contact in wedding cards need to the groom and the bride, regardless of the extent of your love, a greeting phrase should be polite and concise. If you are not too close, it is not necessary to start the postcard with "Dear", "Favorite" and so on - just write the couple's names. At the bottom of the postcard, write "best regards, ..." and your name and date. Greeting cards with a ready text should not sign on the blank page, because it assumes that you will have to come up with a great greeting. These cards seem to be overwhelmed and not make a good impression. If you do not want to buy a banal postcard with text, you can purchase original 3D wedding card, which are arranged, turning into an interesting composition. Such gifts typically even have space for a large greeting text, so you will be able to do short-phrase and signature as in the first case. Close friends and relatives of a young family better to try and come up with something original as cards from such guests, most likely, will be read with special attention. In this case it is better to buy blank cards without text, as you yourself will have to write a lot of nice words and good wishes. Start a greeting text with appeal to a young couple. Here you can Express your feelings and to write "Family", "Favorite" and so on. Further, the text may be different: the prose poems of their own composition or from the Internet, a romantic story or legend, ending with good wishes or congratulations. Should be avoided in the text of the postcard impolite expressions or jokes that can hurt someone from the newlyweds. If you are a friend of a young family can afford a little humor in the card, but it needs to be good. 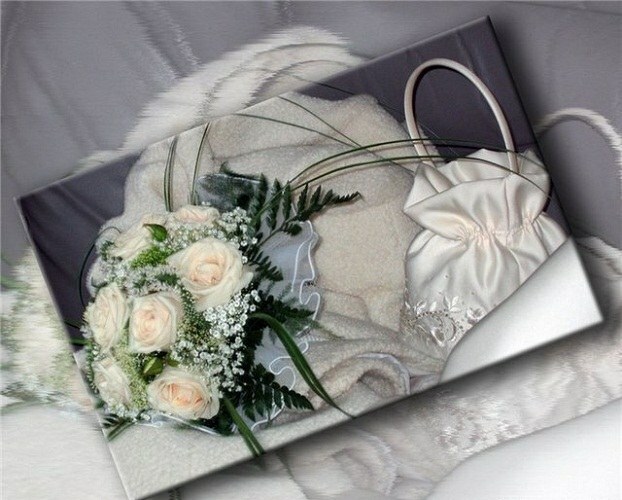 In General, text, wedding greetings has to be touching and romantic, appropriate to the atmosphere of the holiday. Don't forget to sign and date at the bottom of the postcard. It is not necessary to refer the card to your gift. First, the greeting card will be read separately after the wedding when all the gifts will be mixed, and secondly, it's just rude. If you want your card was memorable, spend a little time and effort and make it yourself. Remember that big does not mean good. Better make a card of conventional format, place in her a romantic figure and decorate it with lace and rhinestones. You can also make a greeting of well-known phrases from movies, songs or cartoons and place on the front side of the postcard image or a collage of the text.